For this Iron Craft challenge we were to make something that was either the color green or green in that it used recycled supplies. I went very traditionally St. Patrick’s Day green. Lately on Pinterest, I’ve been seeing these really pretty flowers made from wire, glue and nail polish and then turned into jewelry. It was one of those projects you look at and think, “It can’t be that easy.” Also I was wondering how strong these flowers could be. 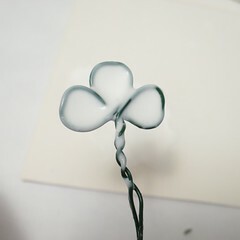 So, I used this challenge as a chance to try the technique, but I made shamrock’s instead of flowers. I have to say I was surprised at how well this worked. I didn’t even look at the tutorials online, I just winged it based on the photos on Pinterest. 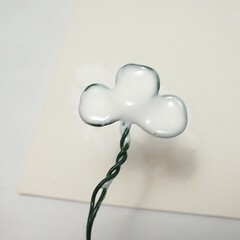 The trickiest part was getting the leaves of the shamrock the same size and shape. It is not a very time intensive project either, except you have to wait for the glue to completely dry. 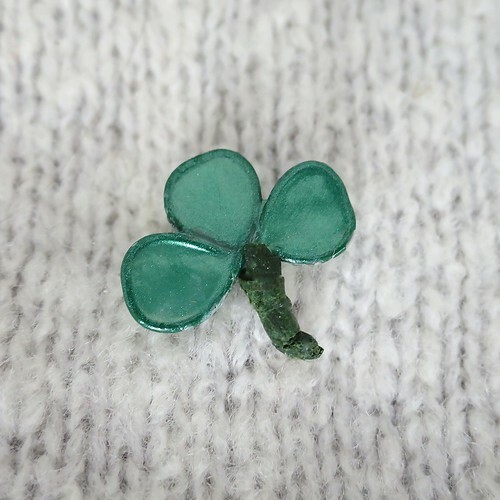 The shamrock is actually quite sturdy once the glue and nail polish are dry. Nail polish is great for this because it really gives a shiny almost enameled look. I’d seen some people talk about just doing this with nail polish and skipping the glue step. I don’t see how that would work myself, even with a thick nail polish, but I never experimented with it either. 1. 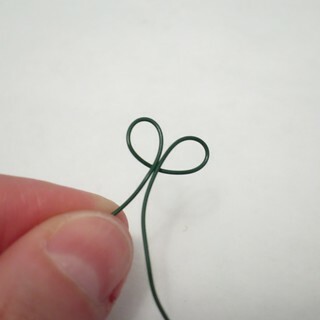 Cut a length of wire. I used about 8 inches, but it will depend on how big you want your shamrock. 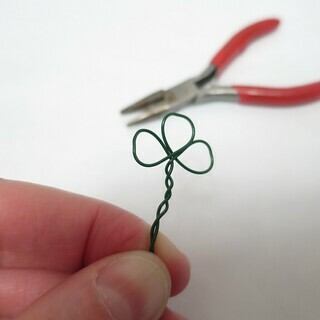 You don’t want to go too big or it will be hard to do step 3, but your shamrock needs to be at least as tall as your safety pin. Bend it in half creating a loop the size you want you leaves on top. 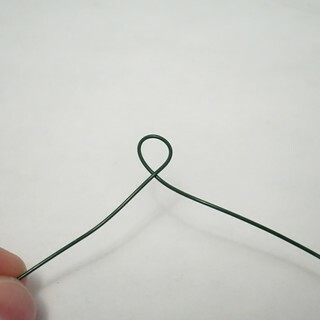 Bend the right leg of the wire toward the center to create a second leaf. Try to keep in similar size to the first one. Turn the whole thing over so the unbent leg is on the right. 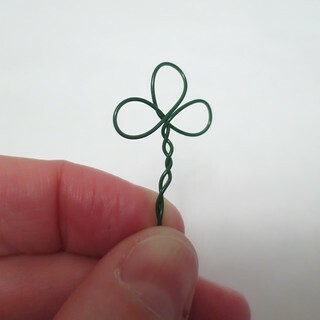 Bend it towards the center to create a third leaf. Cross that leg over the other one and twist them together to form a stem. 2. Bend the leaves a little to give them a similar shape. I used a small pair of flat pliers to flatten the top of the leaves a little. This is really the trickiest part of the whole thing. 3. Fill the leaves with glue, this is why you don’t want the leaves to be too big. 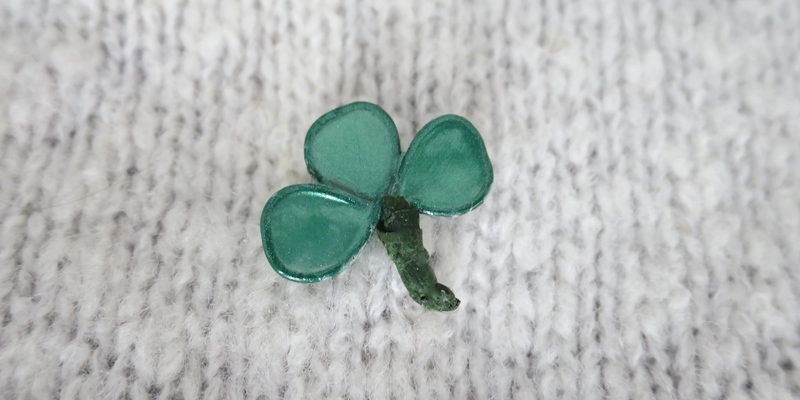 What I did was put down a glob of glue big enough to dip the shamrock in. 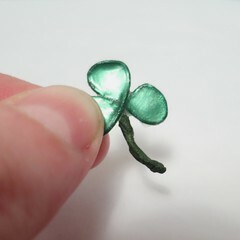 Once I pulled it out I used my finger to help pull the glue from the edges to fill the leaves. I was also successful using a paintbrush and the tip of the glue bottle to do this. 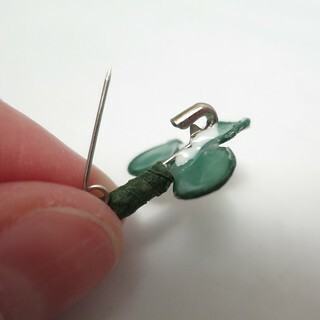 I found it was best to hold the pin, by the stem, for awhile to let the glue set. I turned and held it different directions to keep the glue as even as I could. Then, I picked a front and held that facing up, so the glue is flatter on that side. Here is my front and back. I used a straight pin to clean glue up from places I didn’t want like in between the leaves and stem. Let the glue completely dry, it took mine overnight. 4. 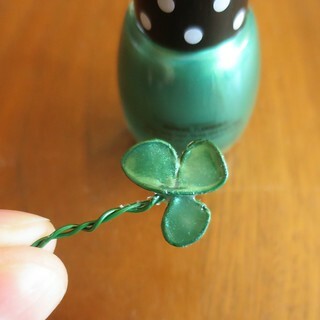 Paint the glue areas of the leaves with your nail polish. I did two coats on the front and one on the back to get the color I wanted. Let dry. 5. 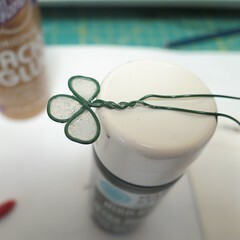 Cut the stem to the length you want and then wrap it in a thin layer of floral tape. 6. 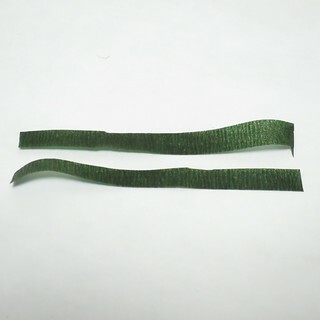 Cut another small piece of floral tape, about 2 inches and then cut it in half width-wise. 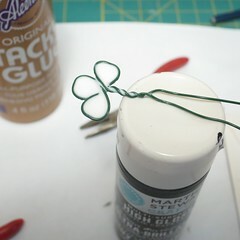 Use that to attach the safety pin to the back of the stem. 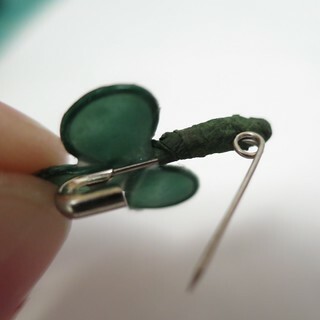 Glue the top of the pin to the shamrock and let dry. Now you can wear your pin and be protected from those nasty pinches. 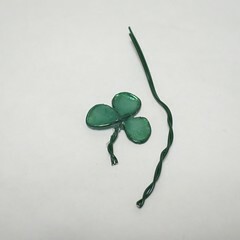 4 years ago by Kat in Challenges , Craft Projects , Crafts , Holiday , Iron Craft , Projects , St. Patrick's Day | You can follow any responses to this entry through the RSS feed. You can leave a response, or trackback from your own site. I would never have been able to figure this out. I thought it was paper covering the wire. Well done on all levels. Yes, I’ve done a similar thing using wire, tissue paper and PVA glue, but it’s quite fragile. I’m definitely going to give this version a go. The glue idea is genius! I’ve done this without the glue and it can be tricky to get the nail polish film, so using the glue to make the film and then paint over it is perfect! yes, I love the technique and they turned out so well. It does have many applications. I see angel wings painted with mica powders.